Back to School&#8230; in Athens! The School of Athens! A famous painting of a near mythological place. Raphael’s piece from the early 1500s is eye catching and enchanting. Featuring a large number of figures lounging about, contemplating, and discussing various topic. The painting is not historically accurate, nor is intended to be. Besides the use of some building techniques not known at the time, like the iconic arch, the figures in this painting are from many times and places. Of course, here in the modern day, we can mat and frame them any which we way like, something they would surely be jealous of. Yes, that’s right. Many of the figures shown here in the School are not random faces. Though not all have been identified, and many are in dispute, there are a number who are clearly meant to depict certain people from history. The two most noticeable are Aristotle and Plato, the central figures of the painting. They are very interesting men, who represent two different ways of thinking about the world. 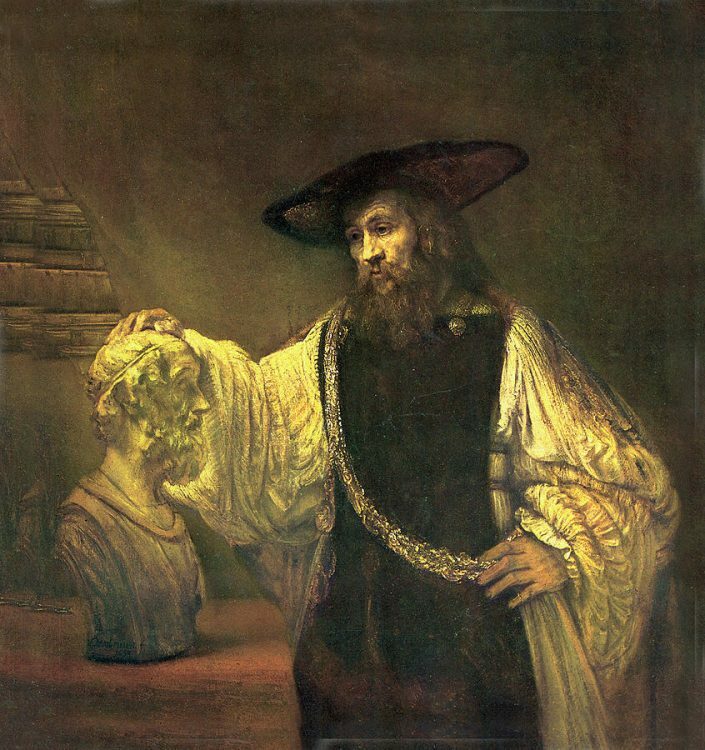 Broadly speaking, Aristotle was more of a scientist, shown above in a painting by Rambrandt. He was interested in finding rational, provable explanations for the world around him. He would look at things in nature and want to find out more about them, about ho they worked. He studied the four elements in an attempt to find out what the world was made of. He also wrote about storytelling, economics, physics, and government. Indeed, it was men like him who discovered the golden ratio, which is so helpful in framing, and many aspects of the design. 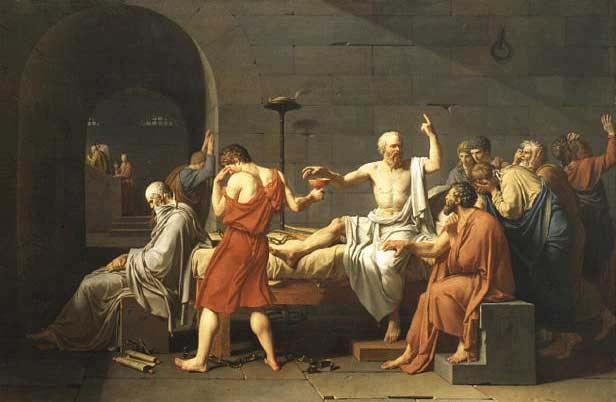 Plato was different, more of a philosopher, shown partly in the painting above by Jacques-Louis David (who’s work we have looked at before), which is technically focused on Plato’s own teacher, Socrates. His studies overlapped Aristotle, in that he also wrote about the ideal forms of government and morality. But he worked with ideals, more based on theory than observation of existing ideas. His Allegory of the Cave is an interesting way of looking how the way the world is shaped. Plato and Aristotle, as the central figures, represent the two very different ways of thinking about the word, which leads to one of my favorite observations about the piece. The actual historical figures in the paintings are on their proper side of the school. That is, the “scientists” tend to go on the right with Aristotle, and the philosophers on the left with Plato. This is more of a theory, since the identities of the figures aren’t all 100% confirmed, but I always thought it helped bring this piece together.